With a distinctive class of its own, the city of Mysore has emerged as one of the most popular tourist destinations in India, and it's not hard to see why. With a stunning diversity of architecture, various museums, art galleries and places of interest, and extravagant dance and music festivals such as its Dussehra Festival, the place has a wealth of culture. Mysore has a wealth of historical attractions. Mysore came to the forefront of attention under top south India ruler Hyder Ali and his equally illustrious son Tipu Sultan who ruled over a large province in South India and took the British hegemony by horns. Mysore is a fascinating city, a place of pilgrimage and joy. The city offers a wonderful holiday destination, offering a window on to the past. The best time to travel to Mysore is during the 10-day Dussehra Festival when the entire city is at its exuberant best. Mysore is also the reference point for the temples known as the "Jewel Boxes" of Hoysala architecture as well as the top Jain pilgrimage site of Sravanabelgola. 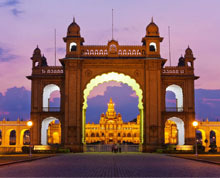 Mysore's most enduring symbol is testament to the pomp and grandeur of one of India's notably wealthy princely states. Built at the beginning of the 20th century in the Indo-Saracenic style of architecture at a cost estimated at the time to be around 4 million Indian rupees, the Mysore Palace is certainly the number-one attraction of the city and is the residence of the Wodeyars rulers of Mysore. Built at the beginning of the 20th century in the Indo-Saracenic style of architecture at a cost estimated at the time to be around 4 million Indian rupees, the Mysore Palace is certainly the number-one attraction of this city in Karnataka. The palace is a repository of exquisite carvings and works of art imported from all over the world. In the palace are Italian crystal chandeliers, stained glass ceilings. Designed by an English architect, Henry Irwin, the new Mysore palace is a fine lend of Hindu and Muslim architecture. The interior of the palace is lavishly decorated with ivory deities, frescoes, intricately carved rosewood doors, mosaic floors, marble figurines and paintings. The armoury of the palace contains more than 700 weapons. Once the former residence of the Wodeyars rulers of Mysore, the palace is at its exuberant best during Dasara (also spelt as Dusshera) festival when the imposing edifice is illuminated at night for a whole month. Added to this, the huge procession led by decorated elephants through the gaily-decorated streets of the Mysore city is worth watching. Son-et-lumiere shows, tracing the history and culture of Mysore are held in vicinity of the Mysore palace. The 50-minute show features in three languages: Kannada, Hindi and English. Photography is strictly prohibited within the palace. Located west of the Mysore Palace, Jaganmohan Palace is another famous palace of Mysore which served as the auditorium of the Wodeyars rulers. Built in 1861, the palace was later converted into an Art Gallery known as Jayachamarajendra Art Gallery which is home to rare musical instruments, a vast array of paintings including the works of Raja Ravi Varma and traditional gold-leaf paintings. Built in the Neo -Gothic style, the imposing Saint Philomena's Church boasts some exquisite stained-glass windows. Located behind the railway station Rail Museum should be visited for knowing the different aspects of Railways. The Maharani’s saloon built in the UK in 1899 is a major highlight of this museum. Located at the summit of the Chamundi Hill at a hight of 3,489 feet, Shri Chamundeswari Temple is a famous religious site of Mysore. The shrine offers a panoramic view of the city below. The towering 40mhigh gateway or gopuram of the temple is worth marveling at. Visiting Mysore, called the cultural capital of Karnataka, is like entering a living museum. The city is home to several other palaces like Cheluvamba Mansion, Jayalakshmi Vilas, Karanji Mansion and Lalitha Mahal Palace. Folk Arts Museum, Regional Natural History, and Private Residential Museum are some of the well-known museums of Mysore. 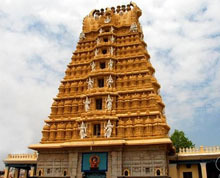 Prasanna Krishnaswamy Temple, Lakshmiramana Swamy Temple, Mahabaleshwara Temple Trinesvaraswamy Temple and Shweta Varahaswamy Temple are the famous pilgrim sites for the Hindus in Mysore. Although comparatively small, Mysore offers a wide array of hotels, ranging from luxury hotels, to budget hotels. If the visitor is interested in the budget hotels Hotel Dasaprakash is a good choice. You may visit Hotel Siddhartha. For heritage hotels the Green Hotel the 120-year-old Royal Orchid Metropole are worth considering. Mysore is 140km Southwest of Bangalore, the capital of Karnataka; 473km North of Chennai, the capital of Tamil Nadu; 1,177km Southeast of Mumbai, the capital of Maharashtra. By Air: The nearest international airport to Mysore is Bangalore. All international and domestic airlines operate flights from Bangalore to all major cities of India and vice versa. By Rail: The nearest railhead for Mysore is the Mysore railway station. You can take Shatabdi Express that connects Mysore with Chennai. A good many train services operate between Bangalore and Mysore. By Road: Mysore is well connected by road to different parts of India. Karnataka Road Transport Corporation and transport corporations of the neighboring states operate bus services. You can have private bus services by private tour operators. Travelling on the Bangalore-Mysore highway is a good way to reach Mysore. Major cities and towns near Mysore connected with it by road are Hassan (118km), Bangalore (140km), Ooty (Ootacamund) (159 Km) and Mangalore (259 km). 16 km from Mysore is Srirangapatnam, a place steeped in history. Once the capital of the Mysore rulers Haider Ali and Tipu Sultan, Srirangapatnam came under the control of the Hoysala rulers and the mighty South Indian kingdom of Vijayanagara. It was at Srirangapatnam that Tipu Sultan was defeated and killed by the British forces in 1799. A major attraction of Srirangapatnam is the Ranganatha shrine dedicated to the Lord Vishnu. Apart from this, Dariya Daulat Bagh, the summer palace of Tipu Sultan, also attracts visitors who come to Srirangapatna to see this building built in the Indo-Islamic style in 1784. Teakwood was extensively used in the construction of the palace. 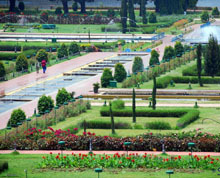 Half an hour away from the city center, the Brindavan Gardens are a delight for the tourists. Visiting the gardens located adjacent to the Krishnaraja Sagar dam in the evening when they are illuminated and provide a grand spectacle. Musical fountains are the special highlight of the beautifully terraced Brindavan Gardens. Ranganathittoo Bird Sanctuary, rich with avian fauna like waterfowl and painted stork, lies 19 km away from Mysore and four km from Srirangapatnam. A paradise for birdwatchers, the sanctuary comprises a string of tiny islets created by the Cauvery river. Situated on the banks of the Kapila river, Nanjangud is a famous centre of Shaivism. 23 km from the Mysore city, the place is home to the famous and massive Nanjundeshwara shrine dedicated to Shiva. One of the must visit excursions from Mysore, Somnathpur is home to the famous Keshava temple, one of the finest specimens of the Hoysala architecture. Raised on a tall solid platform, typical of Hoysala temples, the famous keshava temple, also known as Chennakeshava shrine, is decited to Lord Vishnu. Located in the district of Mysore, Somnathpur is 35 km from the Mysore city. 93 km from Mysore is located the famous pilgrimage site of Jainism, Sravanabelagola, known for its imposing statue of Gomateshwar, also referred to as Lord Bahubali and son of the legendary first Jaina Tirthankara. Carved out of monolithic stone, the colossal 17 metre high statue can be seen from a distance of 20km. 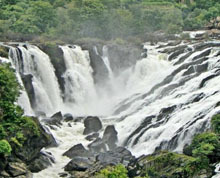 65 km from Mysore is Shivasamudram, a scenic place to view nature’s headlong tumble amidst forested hills and lush green valleys, as the Cauvery River makes a wonderful drop of 75 m in two cascades – known Barachukki and Gaganachukki. Asia’s first hydroelectric power plant is located downstream here. An hour drive from Mysore, situated on the banks of the river Kaveri, lies an ancient pilgrimage centre: the historic town of Talakad. This nondescript small town is home to the granite temples of the Chola and Hoysala dynasties. Here some 30 temples are buried beneath sand dunes. Five have been excavated. These five temples form the Panchalingam, representing the five faces of Lord Shiva. Talakad is 45 km from Mysore. Mysore is synonymous with sandalwood No visit to Mysore is complete without making a trip to the Devraj Market where aroma of sandalwood, jasmine and musk literally spill out into the street. A visit to the Government Silk Weaving Factory, located near NIE COllege, is recommended to gain a firsthand knowledge on how the renowned Mysore silks are woven. Nearby is located the Government Sandalwood Oil Factory where you can see the making of aromatic oils from the sandalwood.